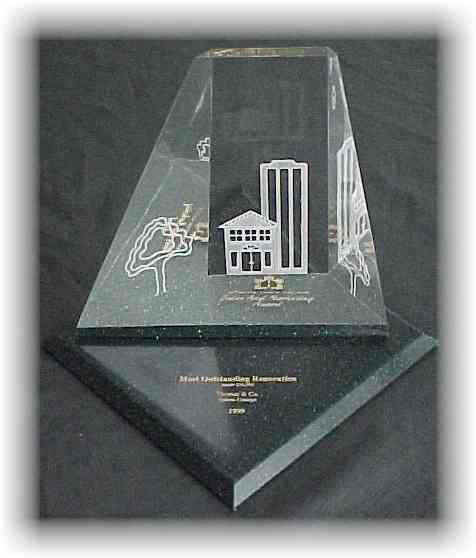 "Most Outstanding Renovation under 50,000, 1999"
Click images to see a larger version. A few weeks ago I traveled to Hamilton, to the Ontario HomeBuilders Association annual meeting, to receive the SAM Award for "Best Renovation under $50,000" in Ontario for 1999. 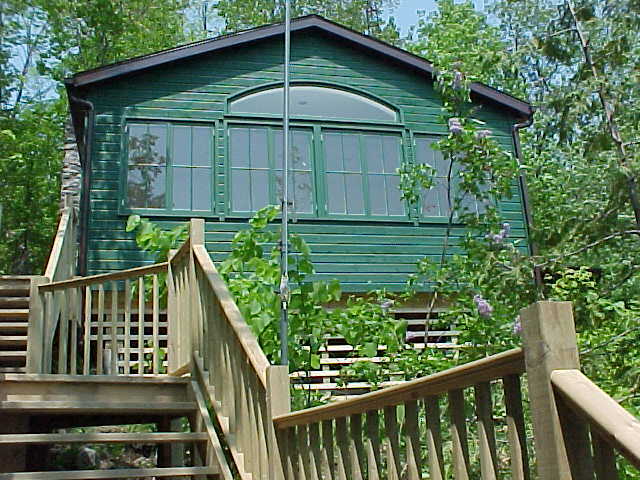 This award was for an addition/renovation to a cottage on Loughborough Lake. 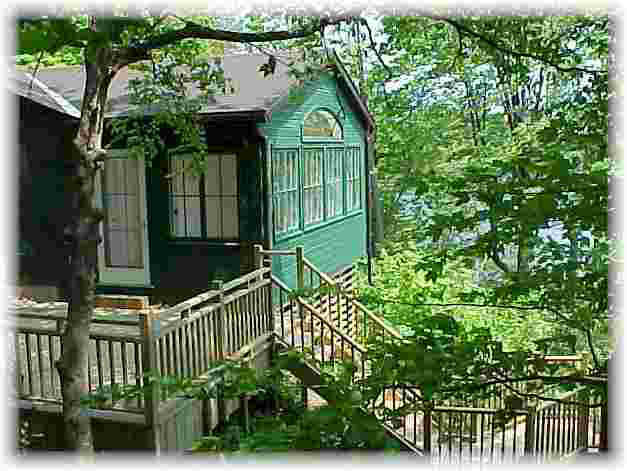 (You can see some pictures of the job at www.jkthomas.com under "cottages"). It was an interesting project for a couple of reasons. First, without the Internet it never would have happened. The clients searched the web and located our site through our link to the Greater Kingston Home Builders Association (www.gkhba.on.ca) And once we had met and agreed to proceed, 90% of the planning and project management was done via the Web. We really appreciated your ability to convert our ideas into your design software. It was also great to receive your scanned photos of the project via email while work progressed. You saved us untold hours of travel time and expense by keeping to a minimum our need for onsite meetings." 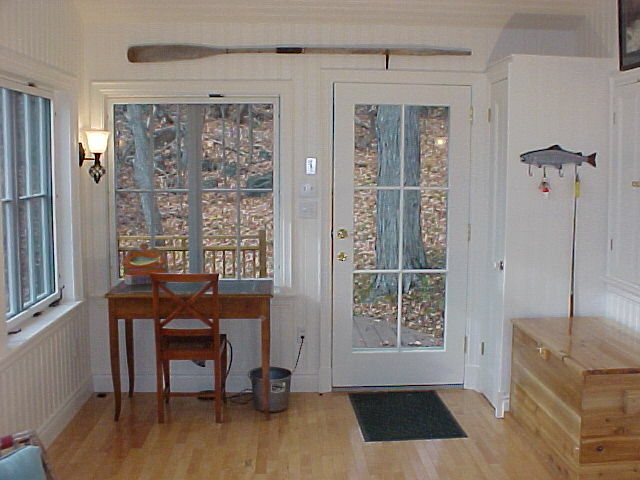 The project also involved the creation of some unusual windows and doors. 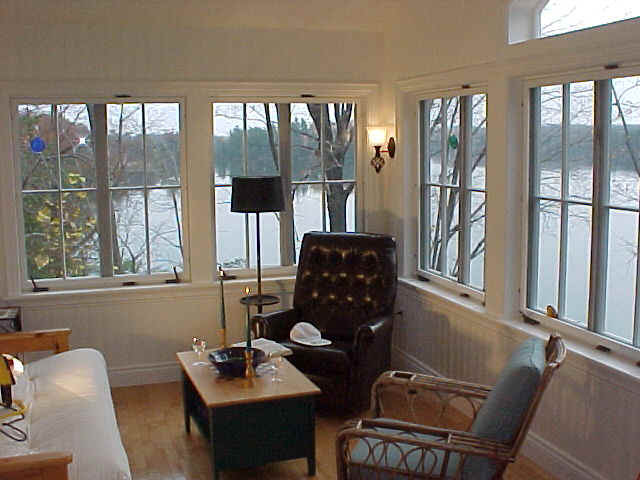 Because of the lake view, the clients really wanted wide casement windows that swung open in pairs with no dividing center mullions. 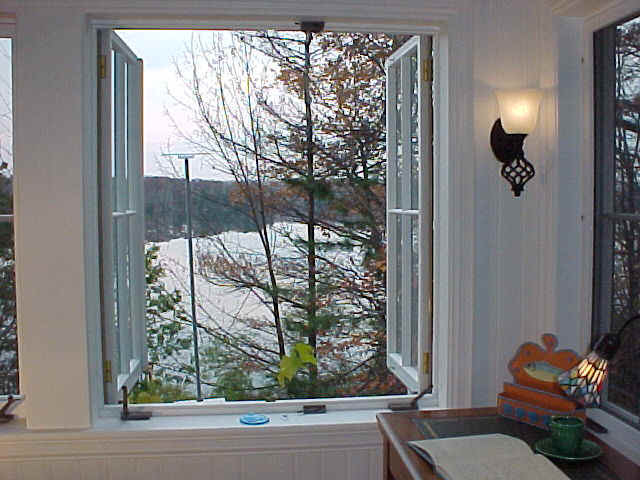 The windows required were virtually unavailable from commercial suppliers, so we had them custom designed and made locally. Renovating is complicated. Any substantial renovation involves a host of subcontractors, plumbers, electricians, painters etc., whose timely contribution is critical to getting a job done well and on time. General Contractors are only as good as the people they employ. Shoddy or late work by any of these trades can literally ruin an entire job in the mind of the client, and so we General Contractors choose these tradespeople carefully and count on them to make us look good. Angus Genge of Angle Aluminum, Kingstons premier siding company, for the careful work on soffits and fascias and eavetroughs. Brian Hawkes and his crew of Hawkes Decorating for their meticulous painting and staining and their unfailing willingness to always go the extra mile. Blithe spirits and woodworkers extraordinaire, Chris and Jack Chapman, for their always great millwork, in providing the arched dentilled window casing and the custom interior cabinets doors. Reg and Carl of Reg Jaynes Plumbing and Heating for their much appreciated suggestions and always conscientious work on the mechanical systems. Mark & Co. of Carlo Delonghi Electric for their uniformly excellent work. Kevin and Co. of CDS Commercial Door Systems for their good advice and good work on the boathouse doors. 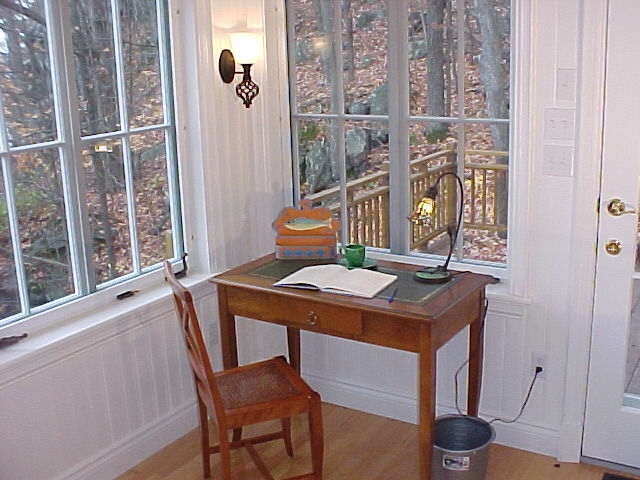 John Inglis of Lothlorien Woodworking for his beautifully designed and produced windows and doors. 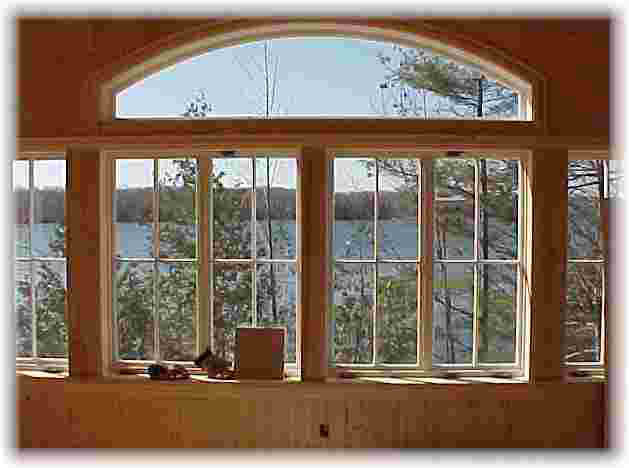 Lothlorien specializes in period windows. And, of course, the talented carpenters at Thomas & Co.who did most of the work on this project: Rick and Garry, Yianni and Marc. I know from experience, they are the best. Visit the What we do page to hear some testimonials singing their praises, and see some of their work.